Researchers at ETH have shown for the first time what happens to atomic vibrations when materials are nanosized and how this knowledge can be used to systematically engineer nanomaterials for different applications. All materials are made up of atoms, which vibrate. These vibrations, or "phonons", are responsible, for example, for how electric charge and heat is transported in materials. Vibrations of metals, semiconductors, and insulators in are well studied; however, now materials are being nanosized to bring better performance to applications such as displays, sensors, batteries, and catalytic membranes. What happens to vibrations when a material is nanosized has until now not been understood. In a recent publication in Nature, ETH Professor Vanessa Wood and her colleagues explain what happens to atomic vibrations when materials are nanosized and how this knowledge can be used to systematically engineer nanomaterials for different applications. The paper shows that when materials are made smaller than about 10 to 20 nanometers - that is, 5,000 times thinner than a human air – the vibrations of the outermost atomic layers on surface of the nanoparticle are large and play an important role in how this material behaves. “For some applications, like catalysis, thermoelectrics, or superconductivity, these large vibrations may be good, but for other applications like LEDs or solar cells, these vibrations are undesirable,” explains Wood. Indeed, the paper explains why nanoparticle-based solar cells have until now not met their full promise. The researchers showed using both experiment and theory that surface vibrations interact with electrons to reduce the photocurrent in solar cells. “Now that we have proven that surface vibrations are important, we can systematically design materials to suppress or enhance these vibrations,” say Wood. Wood’s research group has worked for a long time on a particular type of nanomaterial – colloidal nanocrystals – semiconductors with a diameter of 2 to 10 nanometers. These materials are interesting because their optical and electrical properties are dependent on their size, which can be easily changed during their synthesis. These materials are now used commercially as red- and green-light emitters in LED-based TVs and are being explored as possible materials for low cost, solution-processed solar cells. Researchers have noticed that placing certain atoms around the surface of the nanocrystal can improve the performance of solar cells. The reason why this worked had not been understood. 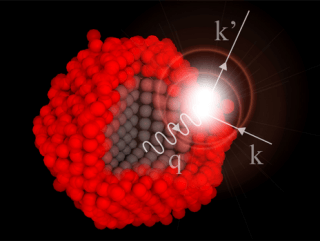 The work published in the Nature paper now gives the answer: a hard shell of atoms can suppress the vibrations and their interaction with electrons. This means a higher photocurrent and a higher efficiency solar cell.